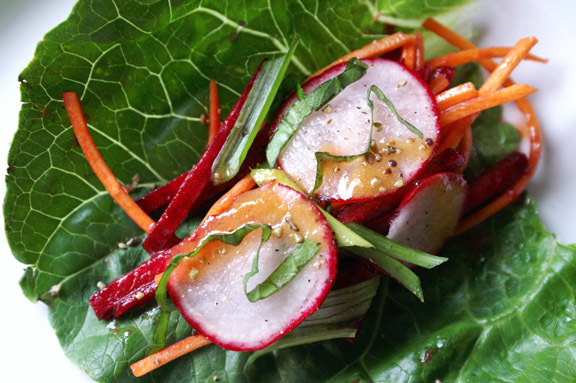 Feast Magazine, October 2013: root vegetable lettuce wraps + citrus miso dressing. 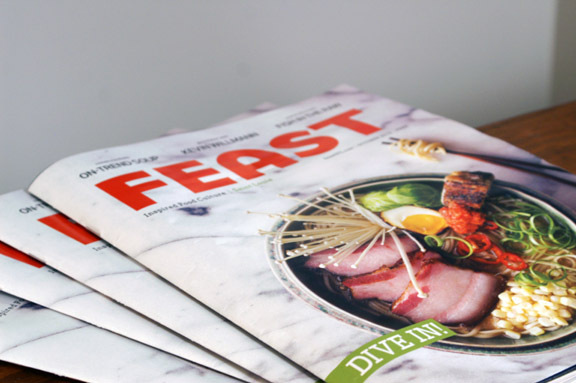 The October issue of Feast is on the stands! Which means I am also on the stands (and on your internets) with a new Mystery Shopper article. Thankfully this month, I remembered to take my own photo of the dish when I made it; since my column is about featuring the ingredient, the finished dish photo for these posts will be up to me. This month, the magazine delves into the awesomeness which is Asian cuisine: there’s ramen, dumplings, a sushi step-by-step, Japanese cocktails, and a user’s guide to choosing one of my favorite kitchen tools, the spider basket. There’s also a stunning feature on one of our esteemed local chefs, Kevin Willmann of Farmhaus (Did you know Nigella Lawson ate at Farmhaus during her 2010 book tour? She did) and his becoming one with the sea. He catches fish, he prepares it beautifully, and it’s a great read on the depth in which he cares for food, where it comes from, and how it’s treated. As if that weren’t enough, there’s some stunning photography courtesy of the wonderful Jennifer Silverberg (who also photographs my column), my official girl crush where photos are concerned. Someday, with a whole lot of luck and practice, I will take photos half as good as hers. This month’s Mystery Shopper ingredient is white miso, which was fun one to work with. I have previously had miso, but had never gotten around to working with it, so it gave me a good opportunity to get to know it in a recipe way. I have to say, miso’s a pretty fantastic ingredient to have in your refrigerator: you wouldn’t necessarily think of it as a kitchen staple, but there’s so many things you can do with it. I made an autumnal lettuce wrap with a miso dressing, and they’re filled with beets, carrots, herbs, scallions, and a little bit of radish for bite. The dressing itself has whiffs of orange and ginger in it, and works incredibly well with the earthiness of the vegetables in this. 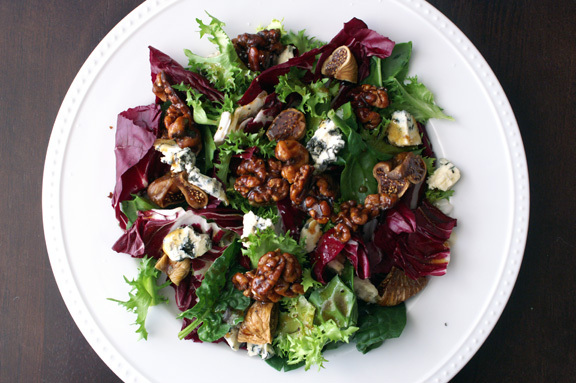 It makes for a pretty fresh lunch this time of year; hearty but not heavy, and salad-like, but with more oomph, somehow. I’ve made this a few times for myself, and although there’s some chopping and prep, it can all be done ahead of time and thrown together for meals for days; exactly what I do when I want a fast lunch during the week. I urge you to try this one for yourself: don’t be afraid of raw beets here, because they have a lovely snap to them that goes well with the carrot and radish here. This one is addictive; I’ll give the miso credit for that. The recipe for my wee lettuce wraps is right here, and be sure while you’re over on Feast to check out October’s Feast TV segment: it’s wonderful, as they always are. Emmy-nominated, friends: as in, the Emmys. Just saying. 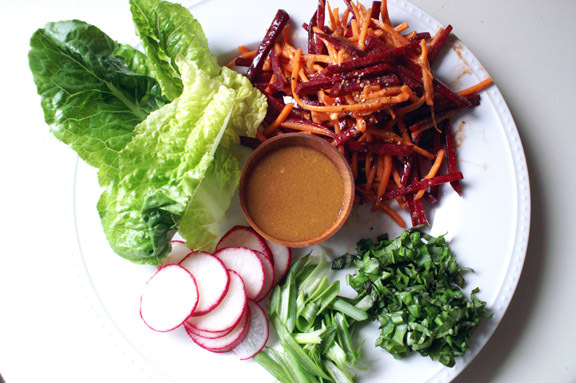 So check out my little recipe for Root Vegetable Lettuce Wraps with Citrus Miso Dressing. It reminds me of that Chinatown Turkey Salad I made last November: totally seasonal, but with a freshness to it that’s perfect for right now. I love it, and I hope you do too. 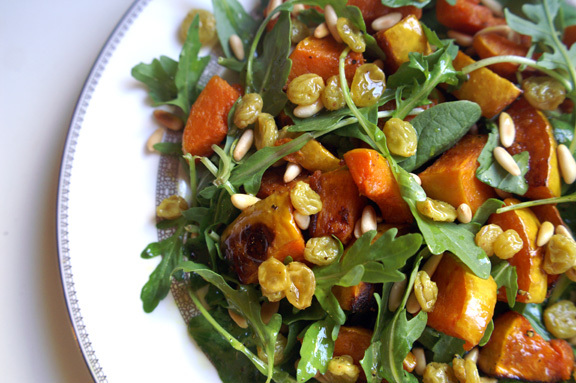 spiced butternut, arugula + pine nut salad. I love miso and is something i always keep on hand. It really is like the secret ingredient that no one pays much attention, too. And they can never seem to figure out what that flavor is! Nice article! Thank you, Abbe! you know, i’m guilty of not paying much attention to miso, either, until i got this assignment. I had had it, but just never bothered to mess with it myself: i was missing out! I’ve been making things with miso ever since i finished this article, and it’s been great. Oh, the Chinatown Turkey Salad! I can’t wait to get some turkey for that….or maybe just make the salad. So zippy! Also – hooray for more of your writing and recipes in print! I’m still so excited for you!!! Remember the turkey salad!! i know you do, because i was so excited when you made it for your own blog. I’m looking forward to my post-thanksgiving meals ALREADY because of that. thank you! I have a lurking container of miso as well, from this recipe: i finish articles a few months ahead (required, certainly not because i’m ahead of the game), so i’ve used it here and there, but i want to use it SO MUCH MORE! thank goodness it lasts a long time. thank you so much, Ashley: it’s been a fun journey, for sure. I’m excited to see where it all goes. 1. I’m so into your new writing career. 2. This isn’t really related, but last night night I ate picked beets and chicken in bed. 1. TWINS: i am ALSO so into my new writing career, mostly because someone’s actually asking me to write words for them. repeatedly. so, totally weird. 2. did you stain things? because pickled beets can be messy. chicken, not so much, but the beets are horrible to try and get out of sheets. Oh, girl. Raw beets + miso is making me swoon! You are just killing it with your big time printed recipes. We have a tub of white miso that’s been in our fridge for way too long. And I love a good excuse to get the guy to eat beets. Anything is irresistible swathed in miso! Another great miso recipe: miso french onion soup. It’s vegetarian, yo. But you can’t really tell! i swear i’m not big time: ask ANYONE here in STL. 🙂 am i excited to see my recipes in print? YES. and i hope that people who read them enjoy them, and maybe make them too. Get out that miso and make these lettuce wraps! they just make you feel healthy, and they’re kind of nice when you need a little pick me up. did you just link me to MISO FRENCH ONION SOUP!?!?! girl. dangerous. i love vegetarian recipes, so i’m all over it. More Feast awesomeness!!! Congrats! I am totally swooning over this dressing, too… I have some white miso hanging out in my fridge just begging to be used in something besides miso soup, so I’ll definitely have to give this a try. Beets + radishes + miso… oh my! 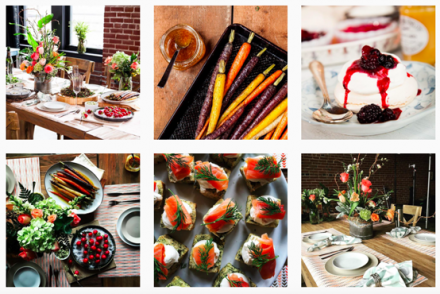 Sometimes i dream that the girls who run Feast say the same thing when they see my article: “OH LOOK: MORE FEAST AWESOMENESS! !” 😉 but i’m betting they don’t, because there’s so many things in the magazine more awesome than i am; i’m just happy to tag along. Also, I think that you’re going to be the final straw in getting me to buy miso…. listen, Feast is SO exclusive that i don’t think you CAN sign up for a subscription with them, but you can sign up for one with me: i’ll send you November’s and October’s together at the beginning of next month. so…you’re NOT a creepy stalker. guess i marked that wrong in my address book. 😉 JUST KIDDING you know i love you. oh buy it! i bet you can find all sorts of awesome ways to use it. just for that, maybe i’ll make another miso recipe for the blog. I love asian food (perhaps it has to do with my 15 year stint of exclusively dating asians) and I love white miso paste! Miso paste pairs so well with orange, so this wrap sounds and looks totally delicious. I JUST read something about a raw beet salad and I thought to myself, “you can eat raw beets? !” So it’s so funny that i’m seeing it again here. Who knew?! I will most definitely give them a try. YUM!!! I started using white miso to make our salad dressings and everyone adores the flavor although they have no idea where the inspired flavor comes from. The veggie wrap is so vibrant and fabulous, a great lunch recipe! Congratulations of being published! it’s totally that flavor that everyone gravitates towards, but can’t put their finger on, i agree! it’s the “what is that in there…that’s good!” part of so many recipes, i think. thank you so much! I’ve enjoyed working with Feast, and i always say i can’t thank them enough for letting me be a part of their publication; it’s really a great magazine, and i wish i could send all of you copies all the time. I have a handful of miso recipes that I clipped during my “need to learn to cook with miso” phase. I never got on board but I will one day. It usually takes me 1-2 years to catch up to my intentions. : ) Very exciting to be on the newstands! You should be so proud of yourself – keep up the great work! ha! and don’t we all go through those well-intentioned little phases, like my “i need to learn how to cook italian things better” or “i need to learn how to make croissant dough” phases. 🙂 miso is awesome: so versatile, and i feel like it lends a warmth and depth to lots of dishes, and it’s pretty safe to experiment with; you know if you go to far, but it’s like soy in the way that you can tell where it’s going pretty easily. I read your recipe! Good stuff. We’re lucky in St. Louis to have two good local food magazines. I’ve done almost nothing with white miso, and I should start playing with it more – it’s quite yummy. Anyway, congrats on all the Feast love. I’m happy you had a chance to read it, John! We are lucky two have two food magazines: there’s lots of larger and medium-large cities that don’t even have one, so we’re blessed, for sure. Thank you so much! I’m excited for the Feast opportunities, and i’m still getting used to it, but it’s been really fun. This really makes me wish it were easier for me to eat something other than PB + J for lunch every day. Aww man. I knew you’d like this. You could maybe pack this up as a salad? more portable, perhaps, than lettuce wraps, and by now it would stay pretty well chilled in your truck. I actually love raw beets way more than any cooked version. Great recipe (and addition to this month’s Feast!). I’ll confess to only eating them once raw before i made this: i remember how much i liked their snap and flavor. Although i do love them roasted, they worked so well raw with all the other fresh ingredients, and it’s become one of my personal favorites. Thank you! First of all, congrats on another home run of a story! Love seeing you in print! Okay, I’m a miso newbie. What brand do you like? Can you buy it in the grocery store, or is an Asian market better? Do you have any other recipes for it? I am so clueless, but I want to try it! thank you! It’s fun seeing your words on a medium besides a screen; definitely something about it seems more concrete, i guess? i don’t know quite how to describe it, but i am humbled and also honored. also, i have a hard time reading my own column, b/c i get afraid that maybe i missed a word or something. Irrational? perhaps. well, i’m a miso newbie also, so i don’t know if i have a favorite brand. i definitely prefer white miso over the red or brown miso, because i think the flavor is intense enough in the white version, and i think it’s more versatile, at least for my cooking (pairs well with veg and white meats and fish.) Schnucks carries it, although limited in choices, i never did see it at Dierbergs, and i’m sure Whole Foods and quite possibly Trader Joes carries it, as it is considered a health food. I haven’t tried the asian markets’ varieties yet, so i will let you know when i get a chance to grab some. Thanks, Shannon! Don’t spend a lot of time looking for recipes! One or two will do. 🙂 Like I said, I’m a newbie, so I think we will be stepping into the miso world slowly. fennel soup + chorizo mini-meatballs.